When hovering my mouse over a planet in the list overview, could the system it occupies be highlighted somehow on the galaxy map (even just having a glowy aura)? I suggest a small feature to be able to see the species in the planet overwiev. As it is now, I either rename the planet to show what species that inhabit the planet or I have to search each planet for the specific species I need. Why I suggest such a feature is that I often use non organic sppecies for my mining planets, thus not having a problem with food. 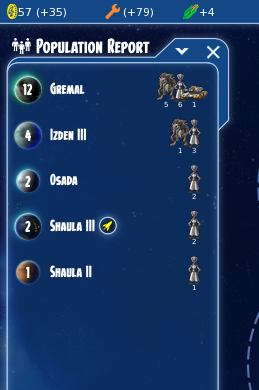 Suggestion: Allow a small graphical icon appear next to each planet name in the list overview the shows the different species that inhabits the planet. 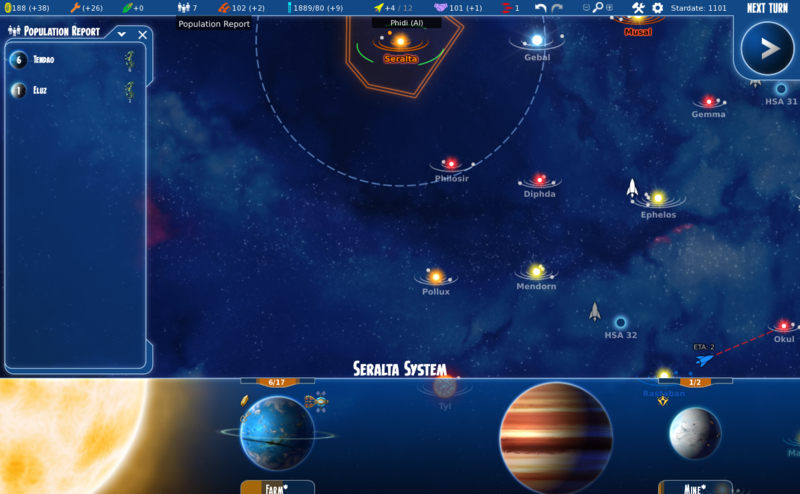 Also allow for the drop down meny on the overview list to sort the planets by species. I was rather thinking in the planet list view (the window to the left of the screen that shows a list of all the planets). Since I often play with 150+ star systems it cames soemtimes become a nuisance to find exactly the right species that you need and to be able to see an overview of this without clicking each individual system would make it a lot better. I wonder how hard it would be to create a new panel to show pop demographics. It would look like the planet list panel except the progress bar would be removed and replaced with an array of pop icons. I guess you could access it by clicking on the food income indicator, nothing uses that currently. EDIT: I managed to put it together. It uses your code to draw the pop icons. What do you think? Perfect, exactly what I was thinking of. I hope we can see it implemented in the vanilla game soon. Where can I get it now, os this something the devs are thinking of putting in in a coming patch? When you capture a ship, after either a certain research level or how many time you handed the ship over to the science team, can actually build that ship under your empire's color scheme. I would also add something to show maxed out population number.10/12 etc like Moo did. Not sure where to put that so that the panel wouldn't be cluttered. I'm trying to match the rest of the GUI style as much as possible. Speaking of which, I've added a top bar icon to access the population report from. I think it's a lot more intuitive than clicking on the food icon. There's a temptation to try to squeeze too much into a small screen element that's supposed to a shortcut. I think there should probably eventually be a dedicated new full-screen spreadsheet colony report screen that would be much more flexible in terms of sorting and visualization than the small planet report that's meant to be open all the time. Captainspire wrote: When you capture a ship, after either a certain research level or how many time you handed the ship over to the science team, can actually build that ship under your empire's color scheme. Interesting idea. Though maybe that would be appropriate as a faction-specific special feature. the ingenious scavenger background of human faction . Or hybrid version between factions captured ship (but that would make a lot of new designs ). Yes, that would be awesome as a race specific trait! abilitie to replace 1 fighter/turn , and repair nearby ships armor and systems 5% , that would fit the survivalist/scavenger background of the human faction . Dragar wrote: When hovering my mouse over a planet in the list overview, could the system it occupies be highlighted somehow on the galaxy map (even just having a glowy aura)? I just noticed that something close to this already exists - when hovering over a planet in the list overview, the little planets on the galaxy map have their orbital rotation increased. So the link is already there - it just needs a sightly more obvious graphical effect. Can we have some visual effects for Interceptor and Bomber hits on enemy targets like we do for the impact from other weapon types? Is it planned to have some visual representation of shield hits?